I am definitely NOT liking Prosecutor Oppa. Just what is his game and what did he get Kyung Hee involved in? And, again, not really liking the love line between Shi Woo and Tae Kyung. It’s not even that cute or enjoyable to watch even though I do love Donghae and he’s proven his chops as an actor. It seems as added fluff or fan service…if fans would really want to see a SuJu member all dorky and drooling over a Rainbow member that is. The episodes this season have definitely been lackluster. The team dynamics in the ME center just aren’t the same and while the police team do have some fun moments, that also seems a bit staler than in previous seasons. We open with a half naked guy dancing around to music, scalpel in gloved hands. He turns the music off, pops some pills, and we can hear some sounds coming from a fridge. I’m sure we can all guess what’s in there. We then cut to the next morning when men find the fridge from earlier in their junkyard. They cut it open (missing the nice little pool of red by it) an get the fright of their life when they find a naked, bloody, very dead woman inside. We then cut to Kyung Hee facing off with the car like a deer in headlights. Prosecutor Oppa then dives and saves her from getting run over. Him being there is too fishy. Kyung Hee curses out the driver and asks what Prosecutor Oppa is doing there. For a meeting. Kyung Hee? She goes to the gym there. At the ME office Jin Woo is trying to pry info out on why Jade Girls disbanded and get the skinny on several scandals between a Jade Girls member and a Super Junice member. Seriously. LOL. But still rather stupid. Just as Tae Kyung is going to spill the beans, Shi Woo rushes in with a case where a mother is angry that the ME’s office didn’t conduct an autopsy and ruled her son’s death as suicide. Dr. Jo angrily scolds Shi Woo as that is outside their jurisdiction and they have enough of their own cases to handle. Jin Woo tries to bring the conversation back around to Jade Girls but that’s when Kyung Hee interrupts to talk about their case. Kyung Hee breaks down what they know and the ME’s office is mystified that such a case came to them because the drug found on the refrigerator, suspected to be from when deranged killer was crunching pills is GABA [GAMMA-AMINOBUTYRIC ACID] which can be used for lots of different things and is also widely used as a health drug, so definitely nothing that can narrow the search. Dr. Jo complains about how they get sent anything now even when there is no clear connection to rare diseases. The autopsy is done and the young woman died from blood loss as expected. So what was with removing the intestines? The first case was the liver. Black market? Jin Woo has Shi Woo explain that it’s not black market medical purposes since it’s obvious the person who cut the woman open has no medical experience. So what is the motive? The police team heads out to the junkyard, but learn nothing more than there was no CCTV in that part of the yard and they can’t distinguish the vehicle that brought the fridge in due to the heavy traffic of that part. So, yeah, they got nothing. Well, they did find a ramen pot, but Doo Mong throws a fit and chucks their precious ramen pot. Kyung Hee goes to the victim’s apartment and tries to figure out how the perp got the woman in and out with no problem. Did he know the victim? Or did he have a job where the woman wouldn’t be suspicious? At the station, our bumbling duo are going through the phone records and find that both women were in contact with a repair center. They rush over and learn the suspected employee is on a pickup. They rush to where the man is and it turns out not to be him. The real perp is in the same complex kidnapping a different woman. He sees the cops and is not happy. During the interrogation the cops realize he’s not the right guy which Jin Woo confirms by looking at the man’s tongue and seeing that it doesn’t’ show signs of taking the chewable pill GABA and wonder just what is going on. They are also horrified to learn another woman has gone missing. Did the man have his cell stolen? No, he did get a new phone, but his wife has his old one. So what the heck? Why is he getting texts telling him not to come and the women go missing? Still a mystery. Doo Mong is not happy that Jin Woo doesn’t have any amazing theories as they re-examine everything and Shi Woo cutely jumps to his defense which flatters Jin Woo, but he tells the young pup to back down. 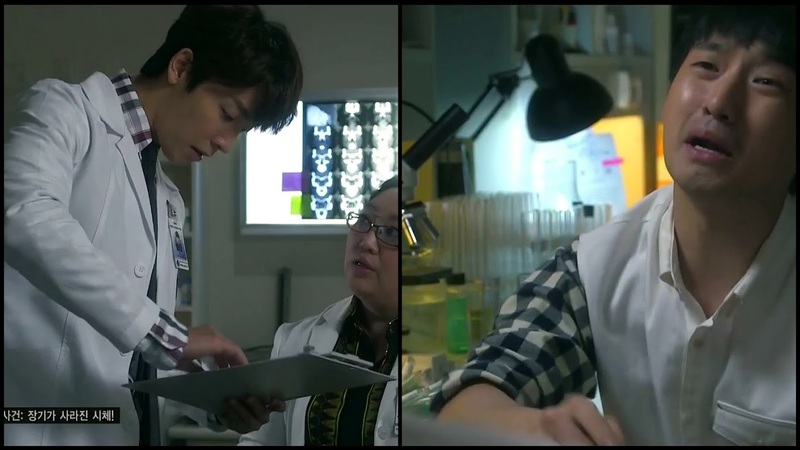 Jin Woo is studying a diagram of the human body and looks at all he has about the case. He’s concentrating really hard to figure out what the GABA can mean in conjunction with the stolen organs and having no luck. Meanwhile we cut to crazy guy going through his ritual only to find his next victim has a scar on her abdomen. Okay, the woman had heart surgery, so why is the scar on her abdomen and not on her chest? Anywho, this makes him flip out and he strangles the poor woman to death. After that deed is done he flips out and screams. And check out his naked chest with all those red lines to resemble the body diagram he has on his wall. Kyung Hee is restless with no further advancement on the case. She starts looking at the info Prosecutor Oppa gave her and there’s pictures of barrels with like radiology symbols and a dead man with a foaming mouth. There’s also a paper marked confidential with information. Somehow I think this is the reason she’s in trouble thanks to Prosecutor Oppa. We do see him, by the way, talking to crazy stalker on the phone. Kyung Hee’s death has been ordered, but Prosecutor Oppa says she is not to be touched. Crazy Stalker says Prosecutor Oppa isn’t his boss and thus he’ll talk to the higher ups one more time. The convo ends and Prosecutor Oppa screams in frustration. Just what is he involved with? They get a call about the strangled victim and the team worries. Jin Woo, catching site of the scar knows just why the MO changed. The killer switches out the card on his phone and then uses it to text someone pretending to be a realtor. Since he knows he can’t use the fridge excuse anymore he’s got to use a different angle to greet his victims. 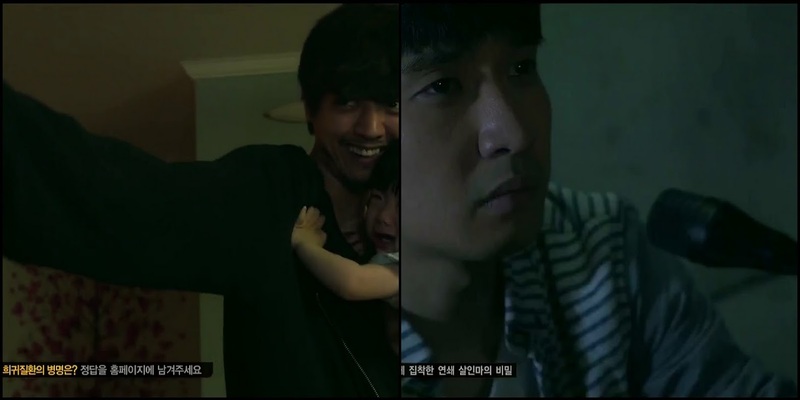 We then get to see Shi Woo looking at the same info Kyung Hee was passed by Prosecutor Oppa. WTH. Looks like he’s interested in that case, but after what Jo said, he’s keeping his interest caged. Shi Woo and Tae Kyung join the others to hear about the hair found under the victim’s nails. She did grab a fist full of hair and the perp didn’t get them all. The hair is in a bad state which leads to some type of disease. Jin Woo seems to be putting more and more pieces of the puzzle together while the detective team remains at a standstill without too much new info to go on. We also get more pointless flirtation between Tae Kyung and Shi Woo. Meh. I like Jin Woo’s teasing of Shi Woo more so than seeing the nervous flirtation. 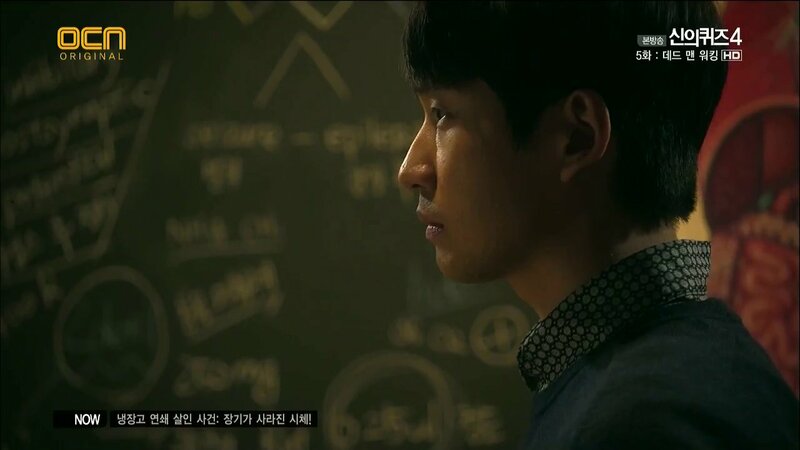 With the drug list that Shi Woo hands over after Jin Woo teases him, the pieces finally fall into place. At the next meeting, Jin Woo decides to tell his theory. He believes the killer has Cotard’s Syndrome. People actually have a mental disorder believing they have are decaying, dead, or nonexistent. This is why the man is collecting organs—to heal himself. The problem is there are only two people that have Cotard’s in their database and the only male is dead. So Jin Woo has the team narrow the search down to a male with a certain types of the herpes virus which he believes helped exacerbate some of the criminal’s problems. Kyung Hee and Doo Mong get into their past history and squabble and fight since they are still spinning their wheels and have no new leads while at least the ME’s office is working hard on narrowing their search. Some thugs are dragged in and Doo Mong is upset that they are getting those criminals when it’s not what their team is for. The men were dealing duplicated cells and the light bulb goes off. The man had to have a duplicate phone of the man’s. So they call him up to learn where he bought his phone. 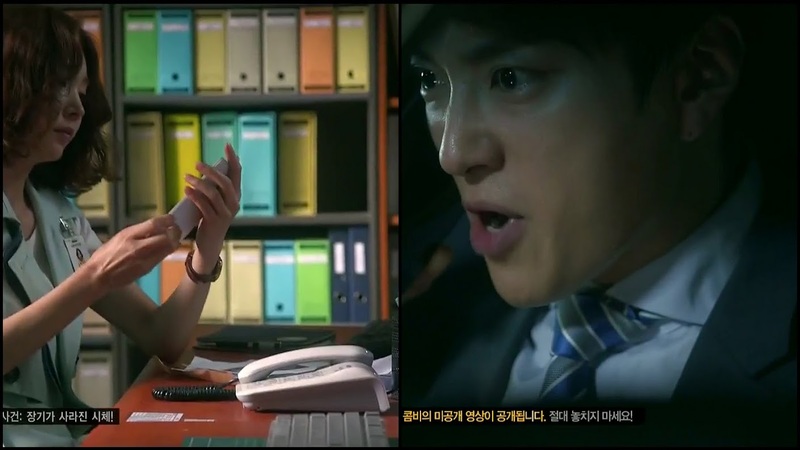 At the same time, the ME office discovers a match and Jin Woo sends the picture to Kyung Hee and the store manager confirms the killer’s identity. The killer is happily getting ready to meet his next victim. Our team storms into his house, but he’s at his secret lair. Kyung Hee does find internet bills for a separate location and they rush out to find it. He’s gone to his next victim, but his webcam goes off and he sees the police are there. That means he won’t go back again and will do the crime most likely at the victim’s. 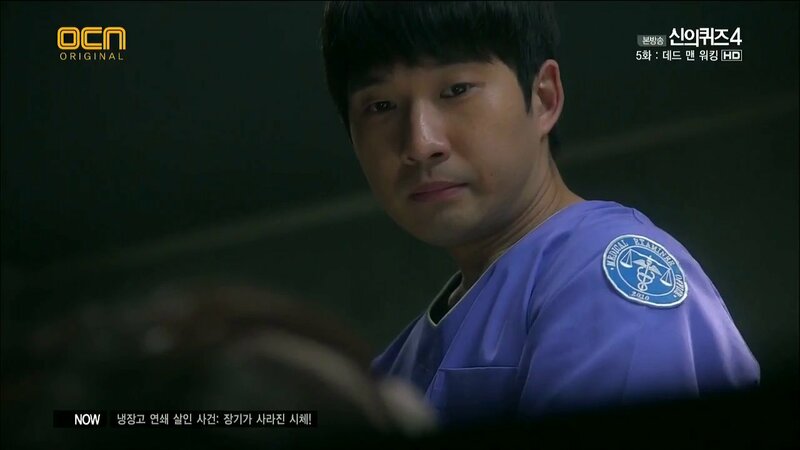 Jin Woo points out that the next organ will be the heart based on the new medical equipment still in the lab. They warn women about the realtor scam and then have cops staking out the two single women’s houses. Jin Woo then points out about how the heart is the most holy, particularly the heart of an infant, so single women aren’t the target this time. Kyung Hee and Jin Woo get on the road when the get a text of an address where woman’s husband is out of town on business and she’s alone with their child. They put the pedal to the mettle and manage to get their before crazy killer takes out the poor baby’s heart. When he’s taken to the station he pleads his case and talks about how he’s decaying and Jin Woo agrees that he is—his soul has been decaying and he doesn’t even know it. Isn’t it odd that he goes for that baby’s heart when he could have gotten that little girl’s heart who was playing all alone in the park when he came by. Was it because she was dirty that he didn’t take it? Or was she still too old. Jin Woo later pleads with Kyung Hee to eat even more with him after a huge dinner. Jin Woo catches sight of crazy stalker. He doesn’t bring it to his cop girlfriend’s attention though. What’s funny is he notices her stalker before she even does. Of course, there is our usual Da Mi scenes where Jin Woo has his usual conversations that he had with his dearly departed mentor with her. This time he talks about taking things you want and Da Mi says while she desires what others have she knows that if she takes it, the fun is over. Plus, waiting makes things more exciting, doesn’t it? And that’s it for the episode. No scenes shown with our stalker next episode, so I wonder if we’ll get more of that mystery or not? But Shi Woo is definitely obsessing about what that case is, so we will hopefully learn a little more about this mystery. We also have little Da Mi collapse! What’s her deal?